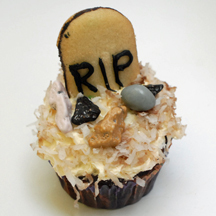 Make a whole tray of these tombstone cupcakes to get the full graveyard impact. Any oval or rectangle cookie will work: Milanos, Nutter Butters, etc. This entry was posted on Sunday, September 16th, 2007 at 10:27 pm	and is filed under Halloween cupcakes. You can follow any responses to this entry through the RSS 2.0 feed. Responses are currently closed, but you can trackback from your own site.